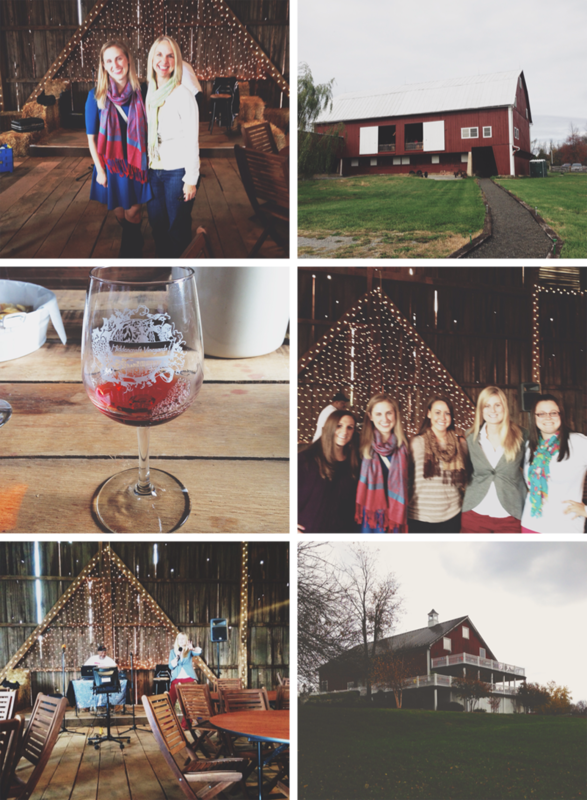 Friday was one of my BFF’s birthdays and we decided to take advantage of the fall foliage and go wine tasting. Loudoun County has an absurd amount of wineries, and I’d never been to a single one! We got a little bus and wound up making it to two vineyards- Hiddencroft Vineyards and Sunset Hills Vineyard. We had so much fun! Hiddencroft has such a pretty barn and we were pretty much the only ones there for most of the time. At the end, they even had karaoke set up! (That’s the birthday girl singing Whitney Houston’s I Will Always Love You, she rocked it.) The moms were smart and brought a bunch of cheese and crackers, so we just snacked and drank wine and chatted. It was awesome! What were you up to this weekend? After wine tasting, we had a family get-together at my parents’ house to celebrate the fall birthdays (aka me) and then on Sunday we visited with Brian’s family for a little bit after I picked him up from the airport. Some of these are repeats from Instagram– come find me! I’m still getting the hang of it. When we lived in VA, I loved going out to the wineries! Hope the storm doesn’t affect you too badly over the next few days~! Thanks! Brian and I are back in Lexington, so it’s we’re not seeing much of it, but Loudoun County cancelled school for today and tomorrow! Craziness. That looks like such a wonderful time. I miss being closer to vineyards! And I love your scarf, by the way. Hope you’re staying safe and dry in Virginia! How pretty, looks like a fun time! it looks so beautiful where you live! p.s. quick question re: your comment form. each time i go to leave a comment it makes me put in my name, email and website all over again. it’s kinda annoying because i’ve commented before. is it just me? Hmm- I know when I comment on other WP blogs in Chrome, I can just click on each box and every way that I’ve filled in that form pops up, and then I just click on the correct one, so I don’t have to retype it every time. Does that make sense? What browser are you using? Looks like a great way to spend the weekend, and I love your outfit!